This pocket-money Music Finder file contains Music Finder titles and One Touch Settings settings for the 23 songs in the popular keyboard music album 'Easy Keyboard Library - Big Band Hits' (available from many good music retailers). A String Of Pearls ; April In Paris ; Avalon ; Begin The Beguine ; Come Fly With Me ; Fly Me To The Moon ; Get Happy ; In The Mood ; Indian Summer ; It Had To Be You ; It's Only A Paper Moon ; La Vie En Rose ; My Heart Stood Still ; Night And Day ; Oh, Lady Be Good! ; On The Sunny Side Of The Street ; Secret Love ; September Song ; Tea For Two ; The Very Thought Of You ; Thou Swell ; Tuxedo Junction ; What Is This Thing Called Love? 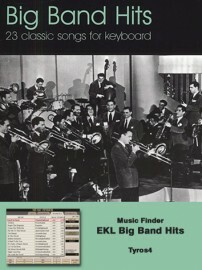 The Music Finder file - ‘EKL_BigBand’ should be copied to a USB stick.